I just got back from a whirlwind of diabetes activities. First there was the 4th annual Roche social media summit. 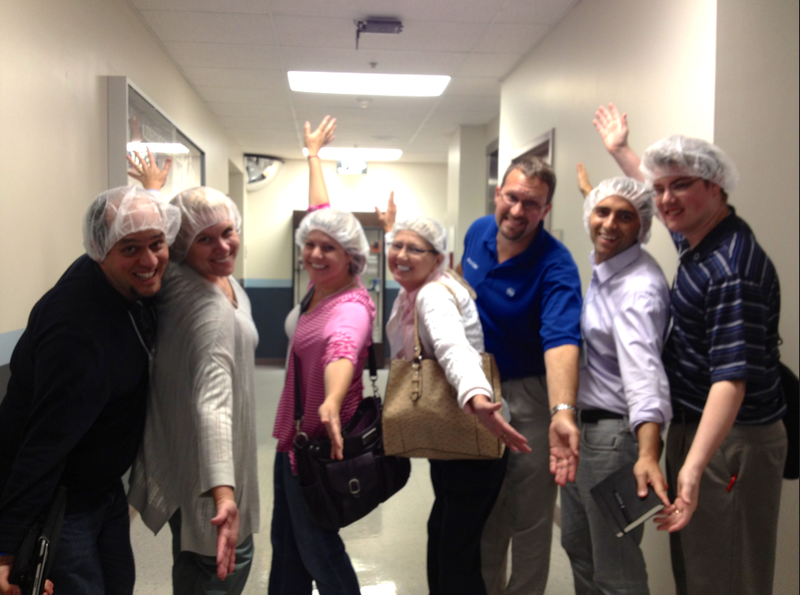 Above my fellow diabetes influencers, hairnets and all, touring the Roche manufacturing plant. Thirty or so of us diabetes bloggers were hosted to one and a half days at Roche’s HQ in Indianapolis, paid hotel and meals. This meeting drew some new diabetes influencer s than past meetings. This year’s meeting was also different than the previous two years. Roche shared with us their new products in development, the launch of their new small, backlit, no-coding, meter Nano, and we heard from two inspirational speakers–one who lost both his legs, Josh Bleill and, type 1 Steven Richert, who is using rock climbing as an analogy for, “We can do whatever we believe we can do!” We were all moved. Truth is, I had no time to write about the meeting and do it justice but many of my DOC (Diabetes Online Community) fellow bloggers did, so you’ll find a few of their reports linked above, and lots of posts by googling ‘Roche’s social media summit 2012.’ AlsoDavid Edelman captured the two day meeting with all its activities. I met with Agamatrix, in Salem, New Hampshire, as part of my investigation on the Huffington Post about meter accuracy. I met with the T1D Exchange (type 1 diabetes) and I’m inspired by what I heard, more inspired than I’ve been in decades. I also met with Dr. Michael Dansinger, who writes on WebMD, is a consultant to TV’s hit, The Biggest Loser, and wrote the Foreword to my upcoming book,Diabetes Do’s & How-To’s. Michael is a passionate man working, as only a handful of others are, on reversing type 2 diabetes. And, one night I dined at the 4th oldest restaurant in Boston with Bryce Sady and Marta Murcia, my colleagues from QuantiaMD. They saw the value of educated patients sharing their wisdom and experience with HCPs through a segment called “Ask the Patient” which I’m a part of helping providers better understand how to help their diabetes patients with healthy behavior changes. Such great food, such exciting ideas flying across the table. Stay tuned for more information on all these visits. All these meetings and learning I will write more about here and on the Huffington Post, but in summary, I was happy seeing my colleagues at the Roche meeting and I am hopeful for all I saw and heard in Boston. For now, as you might imagine, it’s time to put some food in the fridge, unpack, and investigate all this further to make the best sense for you of what’s spinning now in my head. ← Are you sowing the seeds for later regrets now?